What can we learn from the NHS review of Surgery for Prolapse and Stress Urinary Incontinence using Tape or Mesh? NHS Digital published a retrospective review of surgery for prolapse and stress urinary incontinence using tape or mesh, on the 17th of April. The review included women who had surgical procedures for prolapse and stress urinary incontinence using mesh and or tape (tape is a form of mesh) between 2008/09 and 2016/17. This is a seriously difficult report to understand so here we present a summary of the data and the take-home messages. But before we start there are several limitations to this report that need to be taken account of. Results do not include procedures before the audit review period or those that occurred in hospitals outside England or in a private setting. Also reporting of the primary diagnosis is not mandatory in Hospital Episode Outpatient data, only 4.9% of attended appointments had a main diagnosis recorded. There is also no General Practice data that reflects the work and morbidity in primary care. The number of years of follow up decreases in the more recent insertion years. The 2008/09 cohort has the longest follow-up, and therefore we considered the most robust averages with fewer fluctuations. We used this to inform the re-operation rate and outpatient appointment use for nine years of follow-up. After nine years of follow up, 39 (95% CI, 36 to 43) per 1000 women treated with SUI mesh tape required a reoperation. This number continued to rise in the 10th year of follow-up. 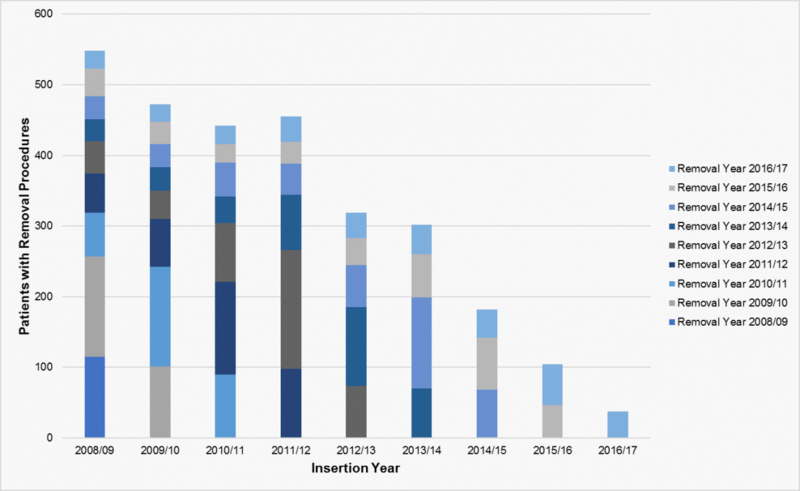 It is therefore likely that the cumulative number of re-operations will go on rising (the reoperation rate will likely persist over the life course of a woman with the implant and is currently around 2 to 3 per 1000 per year). However, this is an underestimate if we wanted to take account of follow-up for all nine years for this cohort of women (in later years women had less follow-up). Table 1.3 shows that 220,618 outpatient appointments were required for the 13,990 women who had an SUI mesh tape procedure done in 2008/09, an average of 15.8 appointments were required per person over the nine years. This results in 1,588,153 appointments over nine years of follow-up for the 100,516 women, who had an SUI tape mesh done, at an estimated cost of £190,578,336 to the NHS. The average number of appointments required per year for the 2008/09 cohort of women (n=13,990) ranged from 70 per 1000 for pain management clinics to 400 for other (not specified) clinic appointments (see Table 1.2). There was a trend for higher rates in later years for many specialities suggesting complications worsen over time. Women with the mesh procedure required fewer appointments for colorectal, general surgery, gastroenterology, pain management and urology clinics than women with non-mesh procedures. There was no difference in rates for Gynaecology, Rehabilitation, Physiotherapy and Occupational Therapy or Trauma and Orthopaedics clinics. These comparisons, however, should be treated with caution, the numbers of non-mesh SUI treated women are small, and these are likely to be high-risk cases. Also, it is not clear if the so-called no mesh group received mesh or not. The code used to identify the non-mesh group was M52.1, a suprapubic sling operation. This operation normally includes mesh tape. After nine years of follow up 17 (95% CI, (95% CI 13 to 22) per 1000 treated with mesh for prolapse required reoperation. This rate increased in the 10th year of follow-up (rate 2.6 per 1000 insertions in year 10). Table 2.3 shows that 51,933 outpatient appointments were required for the 3,073 women who had a prolapse mesh procedure done in 2008/09, an average of 16.9 per women treated. Using this number would results in 456,564 outpatient appointments over nine years of follow up for the whole cohort of 27,016 women – estimated cost of £54,787,709 to the NHS. The average number of outpatient appointments required per year ranged from approximately 70 per 1000 women for pain management to 410 for trauma and orthopaedics appointments. There is a trend for higher rates in later years for some specialities suggesting complications get worse over time. Women with the mesh procedure for prolapse were significantly more likely to be seen in all types of outpatient clinics compared to those with non-mesh procedures. As an example, they were 56% more likely to be seen in gynaecology outpatients clinics (see 2.4). The costs to the NHS are considerable, despite the fact that the costs we have outlined underestimate the true costs to the NHS. Approximately 127,500 women were operated on over a nine-year period, and in the following nine years these women required about 1.35 million outpatient appointments that cost the NHS a minimum of £245 million. The actual costs, however, to women are not revealed by this report. There is no primary care data (the resource use will be considerable, as every referral will generate pre and post-primary care activity); there is no information on the quality of life and no information on long-term morbidity. The report does, however, tell us that the long-term complications persist and likely worsen over time. 100,516 patients had a reported tape insertion procedure for SUI. In 2016/17 there were 7,245 patients who had an insertion a reduction of 48% from 2008/09 when 13,990 patients were recorded. 27,016 patients had a reported mesh insertion procedure for prolapse. In 2016/17 there were 2,680 patients who had mesh prolapse procedure, a reduction of 13% 2008/09 when 3,073 patients were done. 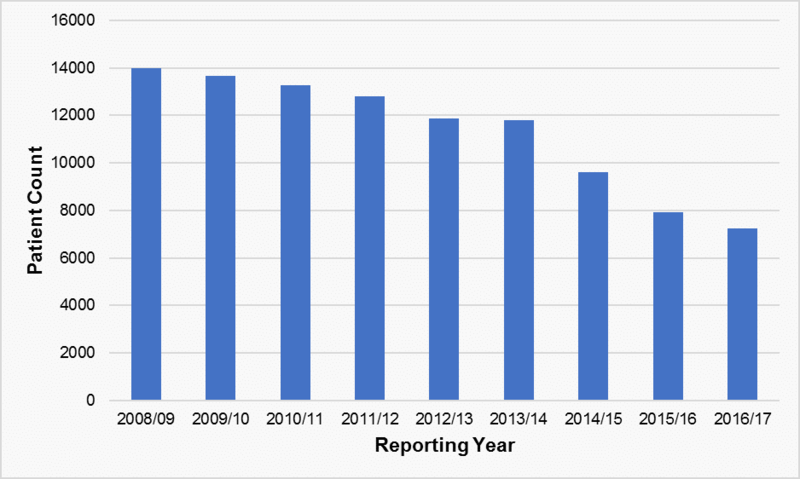 Trauma and Orthopaedics outpatient attendances in the year after the procedure in 2009/10 were 380 outpatient attendances for every 1000 patients. By 2016/17 this had increased to 460 attendances for every 1000 patients. A patient assigned different procedure codes within the same hospital episode will appear only once, and is assigned their grouping according to the following hierarchy: mesh procedure for prolapse > tape procedure for SUI > non-mesh procedure for prolapse > non-tape procedure for SUI. However, the analysis may not identify when a single patient has multiple eligible index procedure codes between different hospital episodes. As such, a patient assigned different procedure codes in different episodes may appear as multiple different data points in the analysis.